IMPORTANT - Restrictions on use Please DO NOT ground handle in the public park/play area north of the Beach Café - due to risk of injury to the public and at request of the local authorities. If you intend flying from the 'South Head' (NW of the St Bees caravan park) please try not to unduly disturb any farm stock (unless it is an emergency situation). St Bees has many unusual hazards that need to be heeded if you are to stay safe. Please read the guide carefully! With care the site can offer some superb soaring on days when it may be blown out inland. South of the Beach Café is a 6 to 15 metre cliff that is slowly eroding onto the beach. This is suitable for inexperienced pilots; as long as they only fly the area in front of the golf course, they respect windy days and do not scratch in too close after launching or if the breeze drops. The cliffs north of the Lifeboat Station can be very unfriendly and are less suited to inexperienced pilots. West and then North of the caravan park a footpath leads to some very impressive sandstone cliffs up to 340ft high, with committing take-offs and no safe slope or bottom landing! The club suggests that even experienced pilots obtain a site briefing before flying this area for the first time. Seacote Hotel. This is right by the main car park. From the main A595 turn off for St Bees at any signed junction. At St Bees make for the huge St. Bees Beach car park which is at the start of the Coast-to-Coast walk - west of St Bees Railway Station. The Seacote Hotel kindly allows us to park on their property adjacent to the old car park we use for take off. Please consider giving them some business! An experienced pilot has told me he's never ever paid to park in the main car park and never been fined (despite the signs...)! Take off for the golf course/beach cliff is directly South of the beach café, usually from the disused car park next to the café, there are also several further take-off opportunities further south along the path between the clifftop and the golf course. Alternatively, you may take off out of the fields, but take care not to disturb stock and to avoid the upwind fence! St Bees School (owns the golf course area). Mr A Crichton, The Mill (behind Rottington Hall), Rottington, St Bees. 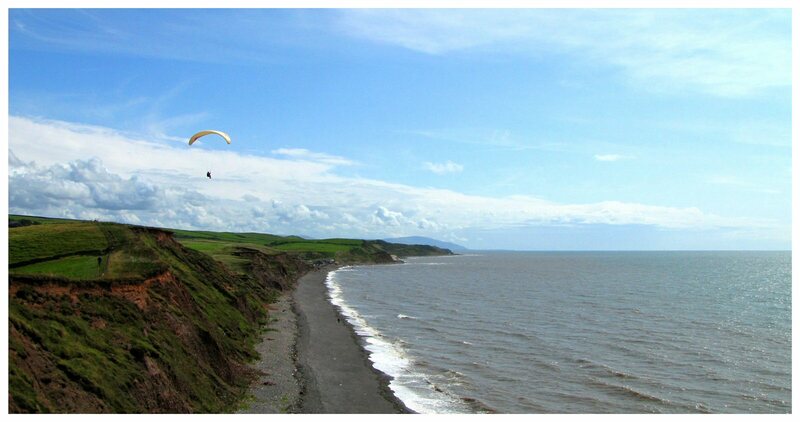 (Cliff-top fields NW of St Bees caravan park). * Indicates unusual hazards specific to this site! The club is concerned at the high rate of incidents at this site! TAKE NOTE AND TAKE CARE! * Generally beware lack of respect and complacency; do not think this site is "only coastal flying" and hence safer than inland sites - IT IS NOT ! Quote from Ed Cleasby: "Coastal flying brings a new set of skills, site and condition assessments and is not to be treated lightly." 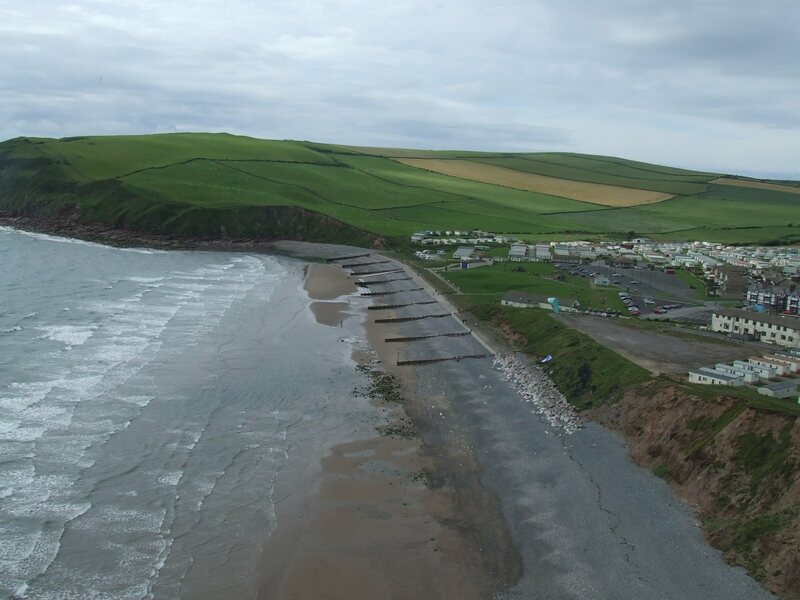 * If St Bees is your second choice of site, due to it being blown out inland, be extra careful; you may have to cope with top end conditions of wind, terrain turbulence and cliff top rotor. * The height and ebb/flow status of the tide should always be known and taken into very careful consideration. * Risk to the Public: Most of the take off locations require good ground-handling skills to launch across busy footpaths; please be careful, considerate and polite at all times. Please take public safety into account if you land in the Public Park/Play Area and DO NOT ground handle in the park/play area north of the Beach Café - due to the risk of injury to the public and at the request of the local authorities. * If you have to land on the beach: Beware huge slabs and boulders at the northern extremity of the beach, and more boulders at the southern end. Beware the wooden groynes on the beach north of the cafe (see photos). Beware getting dry tough bits of seaweed snagging and knotting your lines. Beware landing on the sand and soaking your wing in standing salt water; the club suggests, if you must land on the beach, it is better to land on the stone shingle strip around the obvious high tide line. The area south of the café is suitable for less experienced CPs as long as they don't stray from the golf course cliff area, they respect windy days and don't scratch in too close right after launch. The cliff area to the north of the Lifeboat Station is more unfriendly and less suitable for inexperienced pilots. This part of the site has some committed take off areas with limited landing options due to the beach boulders or no beach! If you lose height and can no longer top land it is a significant glide back to a safe landing. The corner at the very north end of the beach is a known turbulence hotspot. Be aware that if you are flying a vertical cliff face and the wind deviates from straight on, the wind soon has no vertical lift component, due to the lack of slope to force the air up. So the air quickly turns to run parallel to the cliff face. By this time you can't soar because you have either a strong head or tail wind. If you have not flown this site before the club suggests you do not fly the cliffs to the north of the Lifeboat Station unless you have been fully briefed by a 'St Bees experienced' pilot or you have very carefully studied and FULLY understand this guide. Make sure you have a valid flight plan plus options BEFORE you take off! 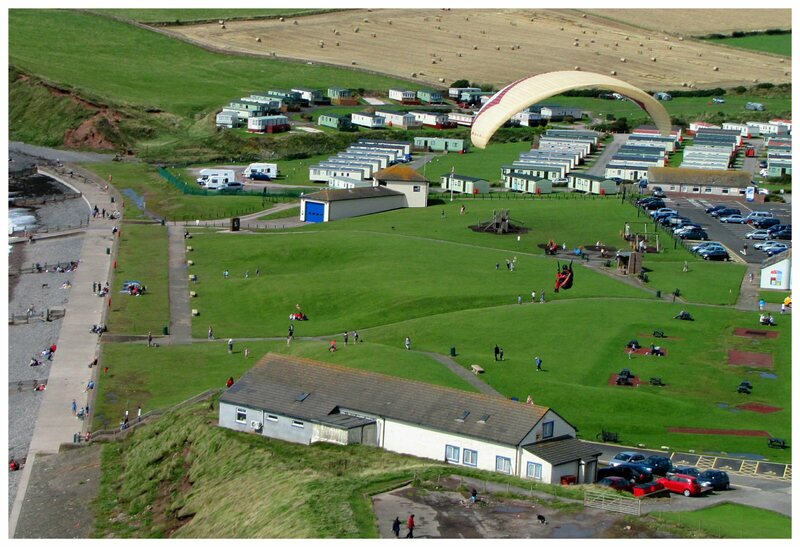 For the golf course/beach cliff take-off is normally from, or in front of, the old car park directly South of the café and requires some ground handling skills and launching across a busy footpath. There are further take off opportunities to the south, some of which may be gentler on your wing than the car park, if you use these please take care not to infringe on the golf course or interfere with play. 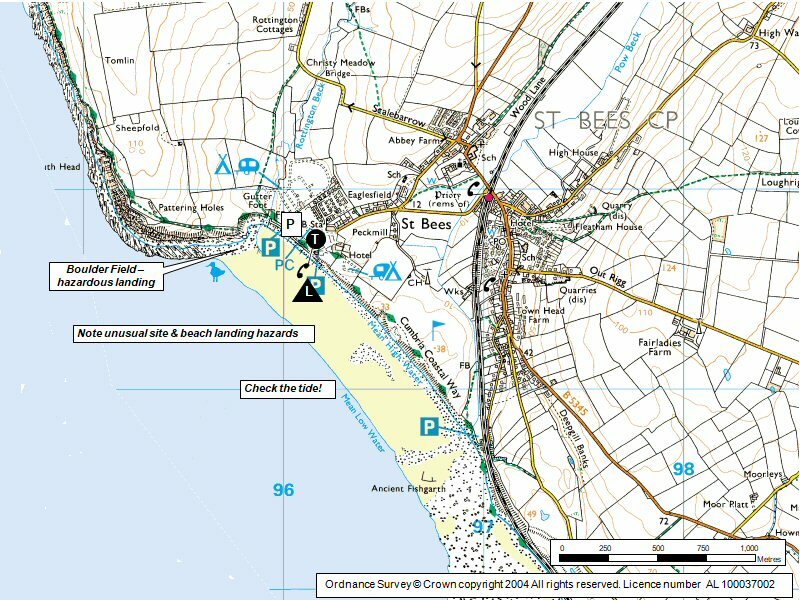 If you intend flying NORTH of the beach, from the 'South Head' (NW of the St Bees caravan park); There are adequate take off places west of the cliff-top fence, which avoid rotor and are away from any stock in the fields east of the fence. Note the footpath has been re routed into the fields, but pilots can use the old footpath to get to the suggested take off areas (see photographs). The lower cliff-top take off is in a corner of the fence next to a bank of gorse, to the west of the fields and the fence, there are bigger (but sloping) take off areas higher up the old path (see photos). If you prefer to take off from the fields, please be aware of any rotor from the cliff top and do not unduly disturb any farm stock. - Land back at take off in the old car park south of the Beach Café. - Or land on the beach, noting the following beach hazards: Beware huge slabs and boulders at the northern extremity of the beach, and more boulders at the southern end. Beware the wooden groynes on the beach north of the cafe (see photos). Beware getting dry tough bits of seaweed snagging and knotting your lines. Beware landing on the sand and soaking your wing in standing salt water; the club suggests, if you must land on the beach, it is better to land on the stone shingle strip around the obvious high tide line. - Or, with care and consideration, land in the public park/play area north of the café, but not on busy days please there have been incidents with injury to the public here! - DO NOT LAND ON THE GOLF COURSE if at all possible! - If you top land a steep sharp lipped cliff, remember to allow for rotor! SOUTH of the beach café; To get established at soaring height you will need to CAREFULLY fly close to the cliffs immediately after take off, otherwise you'll be on the beach. On a good day, if the wind is a little off to the south and with height, you can fly across the gap north of the café, onto the south head and back at will. Great fun but be ready to set up to land if you lose too much height and beware turbulence when joining the cliffs at the north end of the beach. NORTH of the beach is a much larger sandstone cliff, facing SSW and then WSW, with a footpath along the top. Take-offs are committing (no slope or bottom landings). There are only huge boulders and large slabs below, so you will need to top-land, or glide to the beach, or to the park north of the café (taking care of the buildings, lamp-posts and the public) or to the take off south of the café. When soaring the far WSW cliffs further north and out of view of the beach, be aware of the state of the tide in case you come back too low. Also be aware that if you are flying a vertical cliff face and the wind deviates from straight on, the wind soon has no vertical lift component, due to the lack of slope to force the air up. So the air quickly turns to run parallel to the cliff face. By this time you can't soar because you have either a strong head or tail wind. To the south: On a good day you can cross the gap at the south end of the golf course and fly 5km South down the coast and back (beware of power lines, the railway line, Sellafield no go airspace and the UKAEA Police!). To the north: The cliffs north of the old pillbox are experienced pilot territory (where the cliff angle changes from facing SSW to WSW). There might be a landing at Fleswick bay if the tide is out but you would have to be desperate to try it - best stay above the cliff top and top land while you can! 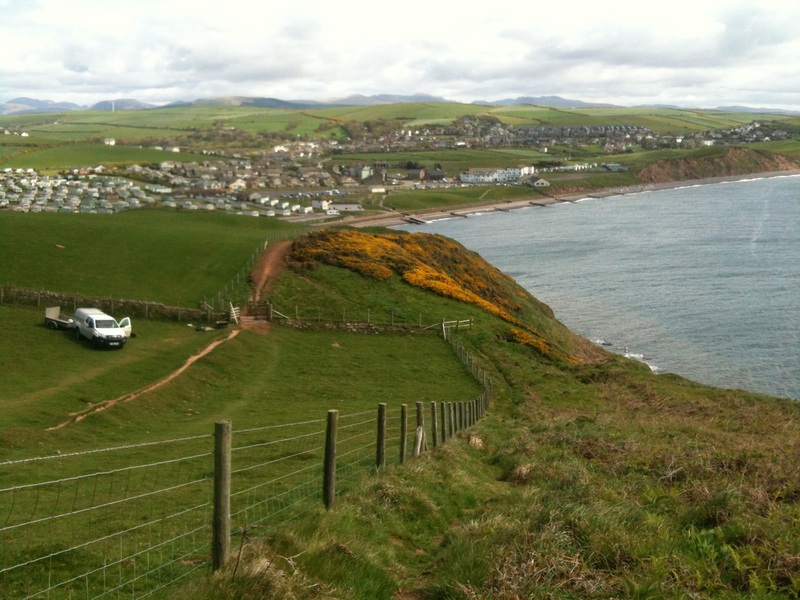 On the right day, with skill & care, you can fly to the St Bees lighthouse and even beyond to connect with the Haig site. Looking south down the southern cliffs. Black Combe in the far background. Photo by Nick Bubb. Google Street View - Parking The car parks at St Bees - packed on a sunny day!